"You can have a cow that is four times as productive with the same survivability." Tweaking genes could be one way of increasing the hardiness of some livestock breeds. By isolating desirable genetics traits from European and African cow breeds, geneticists hope to design a cow that produces high quantities of milk and is also able to withstand exceptionally high temperatures. An Edinburgh-based nonprofit, GALVmed (Global Alliance for Livestock Veterinary Medicines) just received $40 million from Bill Gates to conduct genetic research with this aim in mind. “You can have a cow that is four times as productive with the same survivability,” Gates told the Times. 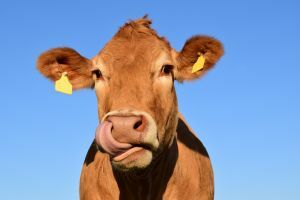 Creating cows that can survive hotter temperatures and produce the same amount of milk as their counterparts that reside in more temperate climates would be a boon to livestock farmers in those hotter climates. Achieving results in Africa “would be very transforming,” Gates mentioned. GALVmed helps make livestock vaccines and medicines accessible to the world’s poorest farmers, genetic engineering could be another means of improving those farmers’ livelihoods. Bill Gates is not alone in the idea that genetically engineering better food resources could reduce poverty and help poor farmers. In the 1970s, agronomist Norman Borlaug helped deploy high-yield, disease-resistant crops that saved more than one billion lives — a global effort known as the Green Revolution. Undoubtedly cows that produce more milk and thrive under the scorching sun would confer immediate benefits for farmers. But an increasing number of experts believe that the goal of boosting the global meat industry is shortsighted. Meat production produces a disproportionate amount of greenhouse gas emissions per unit of protein, compared to edible plants. According to an analysis from the Food and Agriculture Organization (FAO), global livestock produces 14.5 percent of all emissions that are a result of human activity. As more people climb out of poverty and can choose a diet rich in meat, those emissions — and their associated impact on global warming — will only increase. Moreover, meat production also requires a lot of water — approximately 15,000 liters per kilogram of beef. The FAO also estimates that livestock farming occupies around 30 percent of available land on the Earth’s surface — swathes of land that could be used to feed people instead of animals. Some experts even argue that the meat industry hurts the global poor. If all the grains used to sustain livestock were instead given to humans, there would be food for an additional 3.5 billion people. Bill Gates conceded that boosting meat production raises some serious ethical questions, but he believes that farmers in poor countries should be entitled to the same technologies people enjoy in industrialized economies.